The rainy evening did little to keep people away from the bi-annual Thurmont Art & Wine Stroll in November. “I thought because of the weather things would be slow, but it’s been non-stop people,” said Michele Maze with 7 Dragonflies Studios. People like Kevin and Bridget Leahy had to leave and come back later when there was a space at Maze’s table to paint their ornament. She was set up in an area of Hobbs Hardware where people could come in and paint their own free holiday ornament to take with them. Main Street Manager Vickie Grinder also thought the rain would keep the crowds away, but she said they ran out of the wine glasses they give out for the event an hour after the stroll started. The Art & Wine Stroll has been held twice a year for the past four years. “Every stroll grows with more artists and attendees,” Grinder said. This stroll’s participating businesses were: Park Lane Center of Life Pilates and Holistic Health Center, Timeless Trends Boutique, Thurmont Bar and Grill, Hobbs Hardware, Gateway Flowers, Meet Me in 5B, Thurmont Historical Society, Brown’s Jewelry & Gifts, Main Street Center, J&B Real Estate, Kountry Kitchen, and ESP Dance Studio. 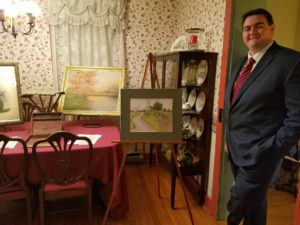 The Thurmont Historical Society was showing the artwork of Cherry Love Ford, a Washington artist who had been living in Thurmont when she died in 1948. Steve Hoke’s grandparents had bought Ford’s house and discovered a set of paintings, overlooked under some paper in the attic. “She has become quite renowned and getting a bit of coverage,” Hoke said. “Her art has taken off in the art world.” He said that the paintings could easily sell for $15,000. Hoke and the historical society are working with a church in Arlington to try and locate a mural that Ford reportedly painted in the church. The local businesses were filled with local artists, musicians, and wineries. They included: Wineries—Links Bridge Vineyard, Detour Winery, Catoctin Breeze Vineyard; Artisans—Gnarly Artly, 7 Dragonflies Studios, Laura Day, Alexandra Farrington, Nancy Houston, Yemi, Charlotte Dutton, Jan Flynn, Cherry Love Ford, Libby Cain, Nicole Lutrell, Rebecca Pearl, Christine Lehman, Barbara Creighton, Dorothea Barrick, Barbara Brittain, Patricia Fisher, Helen Flourim, Marcia Johnson, Susan Orsini, Michele Proce, Mollie Stock, Cynthia Wyant, ESP Dancers; Musicians—Open Easy, Harold Staley, Sherry Kemp, Lyla Zelenka. Cara McMannis is an artist who came from Emmitsburg to wander the downtown businesses and see the artwork. Steve Hoke stands next to the art of Cherry Love Ford, which was discovered in his grandparent’s home. 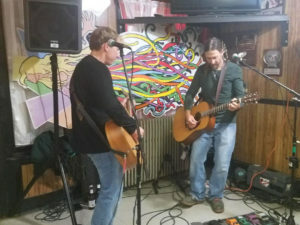 Open Easy performs at the Thurmont Bar and Grill during the Art & Wine Stroll. 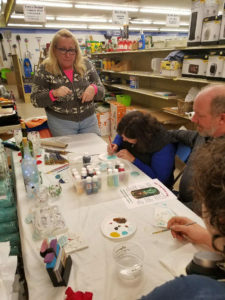 Michele Maze, owner of 7 Dragonflies Studio, helps visitors paint their own Christmas ornament during the Art & Wine Stroll.